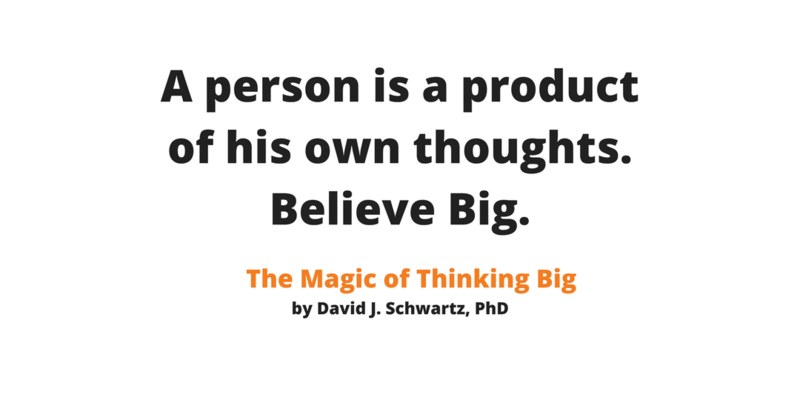 The amount of success you achieve is directly proportional to the size of your thoughts. If you believe you will be a small success, you will achieve small successes. But big thoughts lead to big ideas. Big thoughts lead to big solutions. Big thoughts lead to big successes. Simply put, if you believe that you can do it, you will. If you believe that you cannot, then you will not. Believing big will not guarantee you a 100% success rate in life. We all fail. But you believe in yourself. So, you have the confidence to try again after stumbling. You have the wherewithal to keep trying. Because you know you are not a failure. You try again, and your belief and positive thoughts lead to finding the solutions you need. Your obstacles become your opportunities. Choose greatness. Have big ideas and believe that you can achieve them.